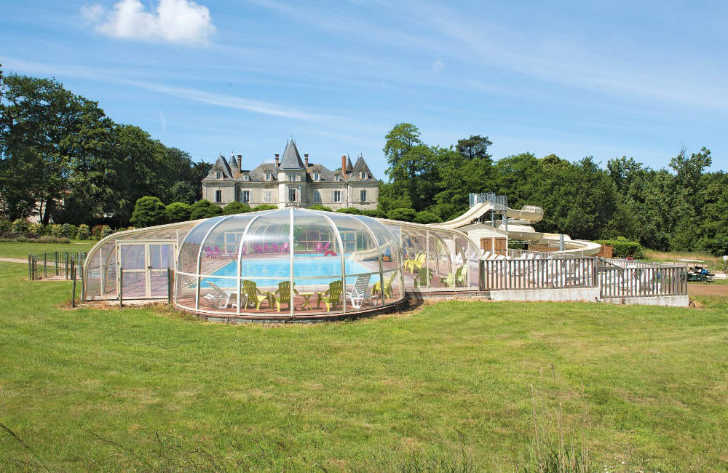 Chateau la Foret is a 4 star campsite located in Saint-Julien-des-Landes in the Vendee region of France. Chateau la Foret is a stunning 4 star campsite that lies within 50 hectares of grounds deep within the Vendee countryside. Part of the Yelloh Village group of campsites, Chateau la Foret campsite as its name suggests is located in the grounds of a beautiful 19th Century chateau. This small and tranquil park is perfect for those looking for somewhere to unwind and relax whilst still having the opportunity to take part in a variety of activities. With such a large amount of space to enjoy it really is difficult to know where to start. The on-site lakes are perfect for a spot of fishing, there are plenty of lovely walks through the grounds for those who’d like to get back to nature and the other sports activities are great for the more energetic families. You’ll even find a treetop adventure course in the on-site woodland. If you’re looking for a campsite next to a beach then Chateau la Foret may not be for you. The nearest beach can be reached by car in a very short time but if you’re looking for an authentic French campsite with brilliant facilities, great activities and where you can make some fantastic family holiday memories together then this is the place for you. The pool complex at Chateau la Foret lies next to the chateau itself and is of a good size with 3 swimming pools including both indoor and outside pools. There are also a couple of water slides which are great for children of all ages and the chateau in the background gives you a feeling of real grandeur. Chateau la Foret campsite offers a comprehensive selection of activities and facilities on site and also nearby to ensure you have a fantastic family holiday. On-site activities at Chateau la Foret campsite include tennis, table tennis, football, basketball, badminton, volleyball, archery, boules, mini golf, fishing, pony rides, playground, trampolines, adventure course, canoeing and cycle hire. Facilities available at Chateau la Foret campsite include WIFI, restaurant, snack bar, takeaway, bar, groceries, games room, animation team, washers and dryers. Accommodation at Chateau la Foret campsite includes a range of 2 and 3 bedroom mobile homes that are available from Eurocamp.